Be thou an example of the believers (1 Tim. 4:12). Long ago, when soldiers went into battle, they dressed in metal armor to protect themselves. They wore helmets and breastplates, and they carried swords and shields to protect themselves from the swords and arrows of their enemies. Today in the battle against evil, we can protect ourselves by wearing a different kind of armor. It is called the armor of God. (See Eph. 6:11–17.) Such armor is what we call spiritual strength. It helps us to withstand temptation and unclean things. If we clothe ourselves with spiritual strength, we can know true peace and be an example of one who puts on the whole armor of God. Mount page 45 on colored paper, then cut out shield A and shield B. Turn shield A facedown. Place shield B to right of shield A, overlapping shield edges. Glue or tape together overlapping edges. Cut dotted lines on shield A. Fold one section at a time of shield A back over shield B to discover what the armor of God is made of. Look up scriptures on shield A to find out how each person listed was a good example. Think how you can resolve to be a better example. Share this activity with your family during family home evening. Enlarge boys and background. Cut shield A along dotted lines. Assign five children to briefly tell the stories of Shadrach, Enoch, Paul, David, and Nephi. Use the Sharing Time page explanation to introduce shield B. 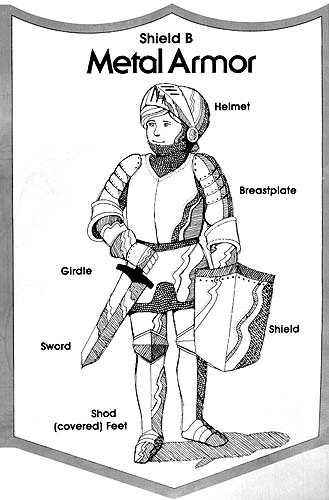 As assigned children tell stories, place spiritual armor over metal armor to show how we can have inner peace. Sing “God of Our Fathers, We Come unto Thee” (Hymns, no. 50). 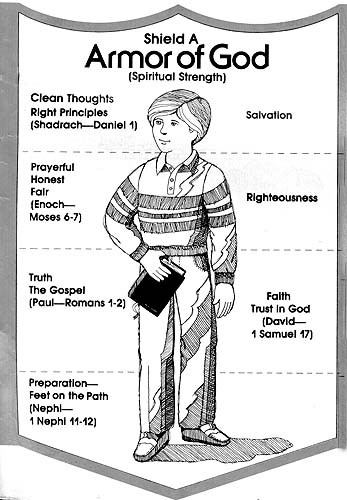 Make a matching game by listing scripture characters such as Noah, Jonah, and Ruth in one column and a short description of how that person was an example of spiritual strength in another column. Each child could design a shield of his own and include pictures or words that tell what he has done to develop spiritual strength. Prepare a copy of the Sharing Time page for each child to cut and glue. Ask him to discuss it with his family during a family home evening.